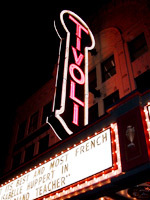 Come down to the Tivoli Theatre tonight in University City for the opening of DANCING ACROSS BORDERS. The documentary is about a young boy with incredible dancing talent that was discovered by filmmaker Anne Bass while on a trip to Cambodia in January 2000. The director will be attending a Q&A after the 7:15pm showing tonight. For more information and to purchase tickets, visit tickets.landmarktheatres.com. DANCING ACROSS BORDERS is a feature length documentary about change, growth and the powerful interaction of many talented people. Produced by Anne Bass and Catherine Tatge and directed by Anne Bass, DANCING ACROSS BORDERS premiered at the 2009 Seattle International Film Festival. In January 2000, Sokvannara (Sy) Sar was performing in a temple with a traditional Cambodian dance group when American dance patron Anne Bass saw him. His abilities made a strong impression on her and after she returned to America the memory of Sy’s performance lingered. After much deliberation she asked the World Monuments Fund, who helped sponsor Sy’s dance troupe, to contact his teacher and parents to see if Sy would like to visit America and audition in New York for the School of American Ballet (SAB) which is considered America’s premier ballet training academy. What unfolds is a tentative negotiation between Sy and the world of American ballet culture — and between Sy and Mrs. Bass and his new dance teacher, Olga Kostritzky. At sixteen Sy was already considered old to study ballet, and so trained privately for two years with Olga Kostritzky, the head of the boys program at SAB. Olga first worked with Sy in a private studio, helping him catch up with his peers — most of whom had already been training for at least six years. A few months after beginning his training, Sy entered SAB where he studied for five years. Then, Peter Boal, a principal dancer with New York City Ballet and one of Sy’s instructors at SAB, became the artistic director of Pacific Northwest Ballet (PNB) and invited Sy to join PNB School’s Professional Division. The first time that Sy performed ballet in Cambodia was when he was invited to be part of a theatrical performance of Cambodian and American artists to celebrate the rededication of the US Embassy in Phnom Penh. A few months later he was coached by Olga for the International Ballet Competition at Varna, Bulgaria, the world’s oldest and most prestigious ballet competition, where he reached the semi-finals. Eventually, Sy was asked to be an apprentice and to join the corps de ballet at Pacific Northwest Ballet. The film follows Sy’s training and development as a dancer through footage that was originally made to inform his parents of his progress in America, and it offers a view behind the scenes of the world of ballet. There is also extensive footage of his performances for the US Embassy in Phnom Penh, the competition in Varna and as a company member with PNB in Seattle and at the Vail International Dance Festival. Many people who have aided Sy since he left Cambodia are also interviewed and they include former Cambodian Ambassador to the US, Roland Eng; founder of the Nginn Karet Foundation, Ravynn Karet-Coxen; and the founder and director of AMRITA, Fred Frumberg. In addition the film follows Sy as he visits his parents and his old school of Khmer dance, and as he attempts to come to terms with the challenge of adapting to a new country while not losing touch with Cambodia. His story is one of growth, adaptation, and belonging as well as of the development of talent and the mastery of an art form. It is hoped that his story will be an inspiration to all young people and especially those of Cambodia as they struggle to regain their identity and hope for a better future following the lingering upheaval of the Khmer Rouge era.